all teams in the Top 4 make a legit case to be #1. Others receiving votes: Grossmont (23 points, 4-0), Madison (20 points, 2-2), Bonita Vista (11 points, 3-1), Mater Dei Catholic (6 points, 4-0), Mission Bay (6 points, 5-0), Eastlake (5 points, 2-3), San Marcos (5 points, 3-2), Poway (2 points, 3-2), Mt. Carmel (2 points, 4-1), Olympian (2 points, 4-1), Valhalla (1 point, 3-1). 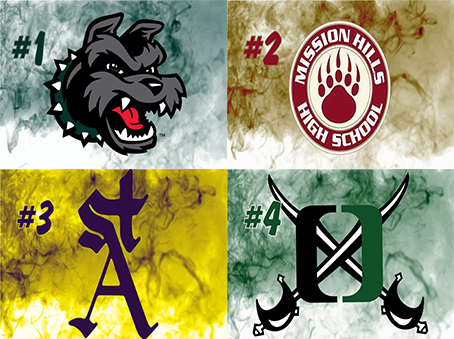 24 sportswriters, sportscasters and CIF representatives from throughout the county vote in the weekly poll. This year's panel includes: John Maffei (San Diego Union-Tribune), Steve Brand, Terry Monahan, Don Norcross, Jim Lindgren, Tom Saxe and Rick Hoff San Diego Union-Tribune stringers), Bill Dickens and Chris Davis (EastCountySports.com), Steve Dolan and Rick Hill (Mountain Country 107.9-FM), John Kentera, Ted Mendenhall and Bob Petinak (The Mighty 1090), Rick Willis and Brandon Stone (KUSI-TV), Rick Smith (PartletonSports.com), Jerry Schniepp and John Labeta (CIF San Diego Section office), Bodie DeSilva (sandiegopreps.com), Drew Smith (sdcoastalsports.com), Lisa Lane (San Diego Preps Insider), Raymond Brown (sdfootball.net), R. Pena, C. Smith and M. Allen (MBASports-SDFNL Magazine).